Clive Griffiths remains confident that Doncaster Knights can hold on to their Championship play-off spot during their testing run-in. Next in action at Lady Bay tomorrow week, Knights remain third but saw several clubs make inroads into the eight-point lead they enjoyed over the chasing pack as a result of their home defeat against Ealing at the weekend. “It’s incredibly close below the top two and any of the sides, apart from Rotherham and Richmond, are a capable of challenging for a top-four spot,” said Griffiths. “I still think that if we win three of our remaining games and pick up the odd bonus point along the way, that will be good enough to see us finish in the play-offs. Three of those games, Jersey being the exception, are away from home but Knights will take confidence from the fact that they’ve won their last two league games on the road and played well in the process. Always totally honest, Griffiths admits that there is still room for improvement in his squad. With having a small squad – the result of going for quality over quantity - injuries are one of the Welshman’s biggest worries. 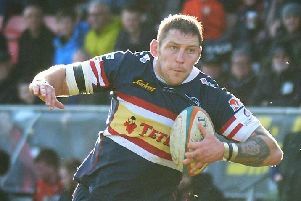 Knights lost two key players - centre Mat Clark and prop WillGriff John - possibly for much of the season against Ealing. Although hinting earlier this week that he will look at bringing players in, he also feels that he has the men within his squad capable of stepping up to the plate. The form of fly-half Simon Humberstone, expected to be available for the Nottingham game following a two-week lay-off with a head injury, means that Griffiths has both options and cover in the key play-maker role.